The question always comes up for me when I’m in Germany, and I suppose this visit was to be no exception. What do present residents think of their past – of Naziism? The answer to the question really has no end. I could talk to residents, as I have, until I die, and I there’s always a chance of hearing a new answer. Each generation seems to deal with its past differently. If I set aside verbal testimony and just look around me – at memorials, at graffiti, at the very laws of the country, the multitude of responses to the question is magnified exponentially. In fact, the wider net I cast, the broader the selection of answers I get. Here’s a small, under representative, and exception-prone sampling: It seems as though the children of the war generation are resentful, both of their parents for what they did and of the rest of the world for associating them with the tragedy caused by their forebears. The generation after that seems resigned to the fact that it happened here and that they are related to the people who perpetrated the atrocities committed during the war. (Incidentally, when I compare the attitudes of the Germans to the attitudes of Americans with regard to that evil institution of slavery or of the Holocaust against natives, I think we could learn a thing or two from this transition from resentment to acceptance). The graffiti around towns that I’ve seen is always anti-Nazi. Granted, I haven’t seen all of the graffiti in all of the towns and cities (there’s a lot of it – it’s an accepted part of culture here in a way that it isn’t in the United States). But that which I’ve seen always seems to be “gegen Nazi” – against Nazis. And the memorials are heartfelt, terrible (because what they memorialize is terrible), and they honor the memory of the dead. 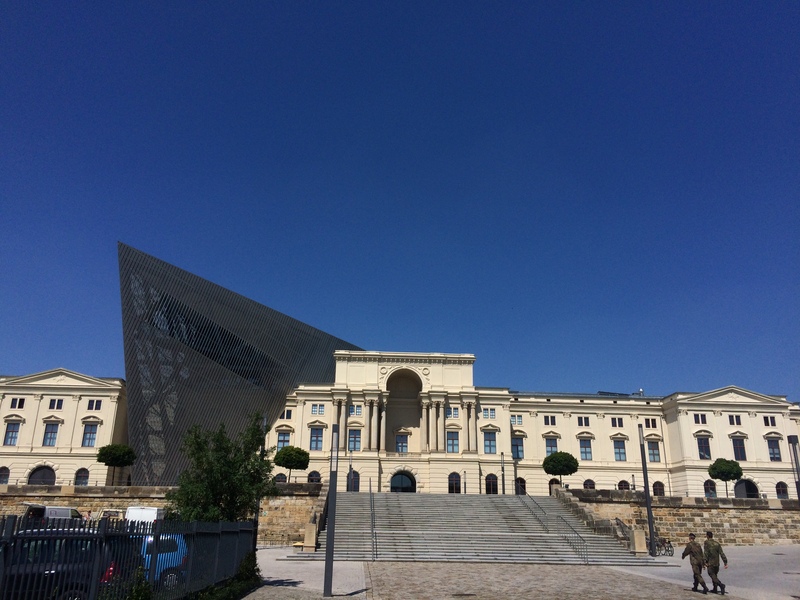 The Military History Museum in Dresden is the largest of such museums in Germany. It is owned by the military. In fact, I gathered that its western wing was originally transformed from an old arsenal to its present state. 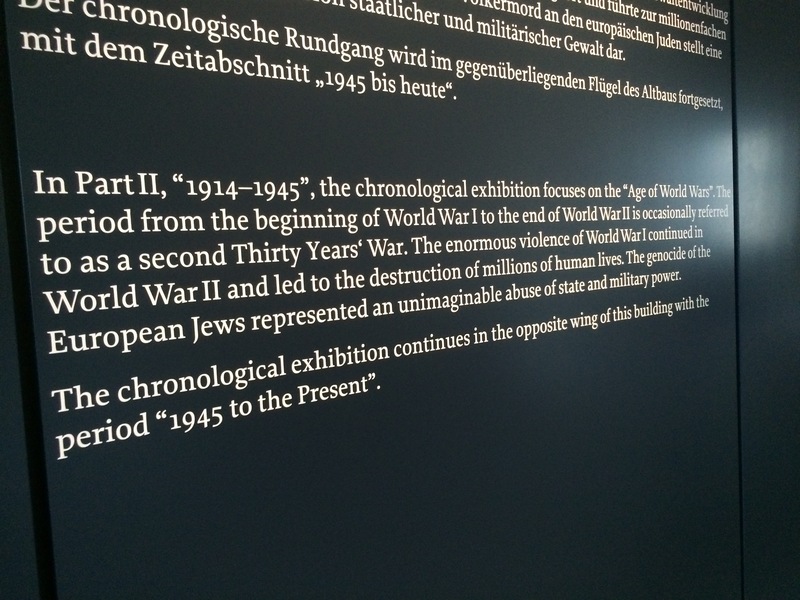 When I visited it in 2014, and again yesterday, I wondered what I do in any German history museum: What’s the take on Naziism in this sampling of culture? 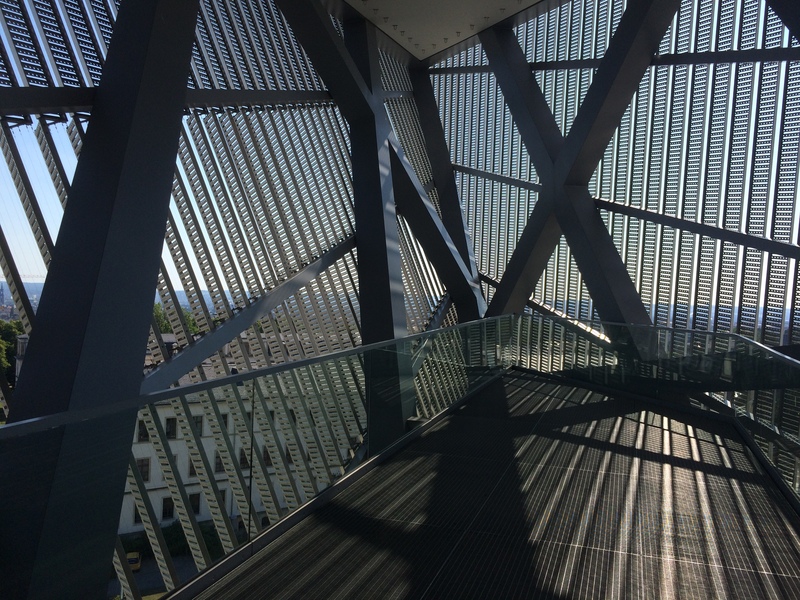 The museum behaves like many academically inspired collections of exhibits: a chronological march through historical events, inventions, conflicts, and treaties. (The collection, by the way, is immense and fascinating, including such items as the 17th-century Latin translation of Hobbes’ Leviathan and a 16th century hanging mortar). When one moves to the second floor, however, and the topic switches to “1914-1945,” the tenor of the exhibits shifts radically. Every bit of the material on Hitler and his followers builds on the theme: Hitler perpetrated atrocities on a massive scale, and millions of Germans followed him, wooed by a propaganda campaign that touched every area of their lives. There are sections in this part of the museum on economics, religion, propaganda proper, and the military. Each asks: how was Hitler able to do what he did? The exhibit pulls no punches. The terror of the whole thing bleeds from every word and every object in the museum’s second floor. Entrance to 1914-1945 section of the Militärhistorische Museum der Bundeswehr in Dresden, Germany. As I said, the army owns this museum, and, through most of my visit, there was a group of young German soldiers being led through both main floors by a docent. In stark contrast to my own meandering, note-taking way of visiting the museum, they marched through the exhibits with military efficiency. I wondered if this visit was a part of their training – I assume that it was, with all of them being in uniform and all together at a military installation. I wondered what they were being told about Hitler’s army (my German isn’t nearly good enough to follow what the fast-talking guide was saying). When I walked through the second floor – the “1918-1945” level of the building – I found myself standing next to one of the soldiers in the section on anti-Jewish propaganda and Nazi regalia. I wondered what he was thinking, and I couldn’t help but wonder if he approved. Is he hanging behind because he hates this stuff more than the others, is fascinated (as I am) by its destructive power, or because he loves it? As I stood next to him, wondering about what he thought, I felt an undeniable fear. 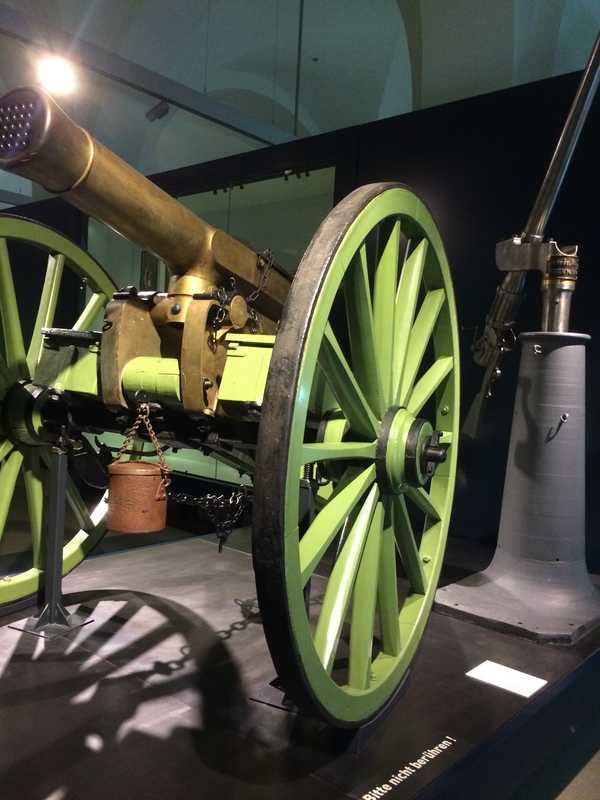 This entry was posted in 2015, Travelogue, Travelogue 2015 and tagged Culture, Dresden, europe, germany, Military History, Militärhistorische Museum der Bundeswehr, Museums, Naziism, Nazis, travel, War, World Wars. Bookmark the permalink. Thank you so much! I will email you. I’d love to meet and learn about your city.